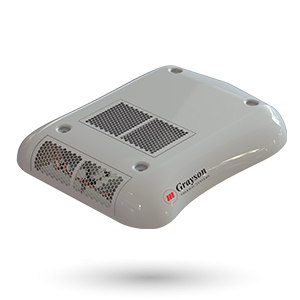 Grayson Thermal Systems design, manufacture, and supply engine cooling, heating, and air conditioning products to commercial vehicle and specialist vehicle industries worldwide. A proud UK manufacturer, we work in partnership with our customers. We develop innovative ways for our customers to improve their vehicle performance and reliability. Formed in 1978, we remain a privately owned, family business with exceptional staff within the organisation. We ensure the core beliefs that have led to our success remain at the heart of our business operations. What is the eComfort 100? Our Grayson eComfort 100 is a driver cabin reversible heat pump capable of heating, cooling and ventilating. A critical requirement for any transit bus operator of electric vehicles. The benefits of our system are it is a lightweight solution which is delivered in an extremely low package height of 200mm. Simple fit and forget system delivered fully charged and ready to go with 24V DC or 600V DC Compressor options.